In 2014, more than 1 million Americans were living with some form of colon cancer, and as many as 4.3% of people will be diagnosed with the disease at some point in their lives. 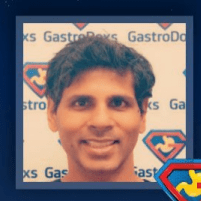 At GastroDoxs, Dr. Bharat Pothuri leads a team of medical professionals dedicated to helping Houston area residents get an early diagnosis and find treatment options for colorectal cancer. Scheduling a colon cancer screening appointment with GastroDoxs is fast and easy — call or book your appointment online today. Researchers are unsure of the exact cause of colon cancer, but it is clear that there is a genetic component. People with a family history of the disease have an elevated risk of developing colon cancer. Diet may also play a role; cultures with diets that are high in fat but low in fiber have higher rates of the disease. Colon cancer occurs when your body’s cells develop genetic errors that cause abnormal cell division. This can lead to tumors and the spread of cancerous cells to other areas. The best way to diagnose colon cancer is through colonoscopy. During the procedure, Dr. Pothuri uses a scope with a tiny light and camera attached to conduct a visual examination of your colon. A colonoscopy is nothing to be afraid of, and the procedure is relatively straightforward and painless. During a colonoscopy, Dr. Pothuri can also remove a small tissue sample for further testing. If he discovers suspicious growths, he can use a CT scan to determine the cancer's stage, which is important when deciding on treatment options. Your treatment path depends on the stage of your colon cancer and your overall health. For early-stage colon cancer, surgery might be a good option, several of which are minimally invasive. Invasive colon cancer requires complex surgical procedures. A partial colectomy is a surgical option that removes the part of your colon that contains cancerous cells. In many cases, Dr. Pothuri can reconnect the remaining portions. For advanced stages of cancer, surgery remains an option but is often used to relieve symptoms, not to cure the condition. Dr. Pothuri urges people to take an aggressive approach to cancer screening because early detection can lead to a cure. Call or book an appointment online today for your preventive screening. We are conveniently located in Greater Houston and look forward to meeting you.